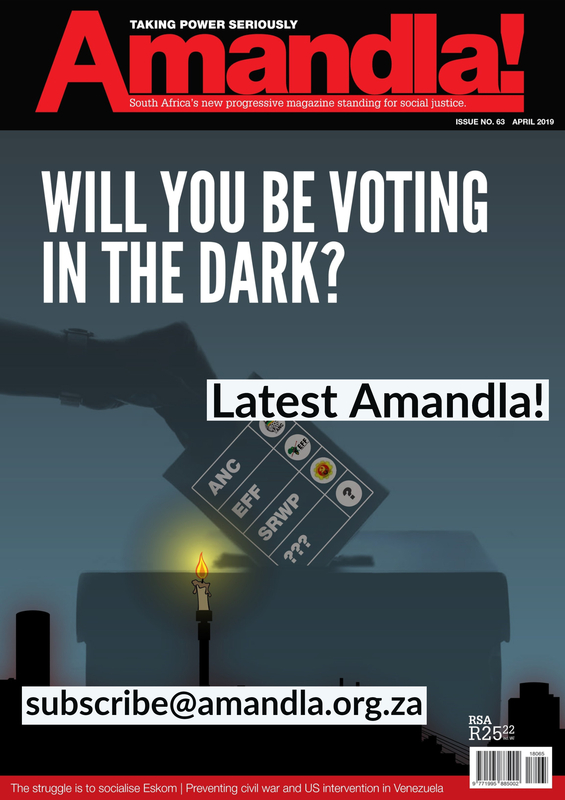 Home › Amandla › We want the Right to say NO! We want the Right to say NO! That’s a common and understandable metaphor in economic contexts. But also a dangerous and misleading one, if it avoids posing crucial questions. Will the tide lift all boats equally? Aren’t some boats much bigger than others? And who even owns a boat, and who does not? When corporations start to explore regions regarding their mining interests, the narrative of the rising tide is frequently used during negotiations with local communities. Equally profitable results from the exploitation of natural resources, beneficial development activities, positive transformation of economic structures, shared prosperity – those are the promises. However in cases where communities try to oppose mining plans of corporations and the state, they are quickly labelled as “anti-development”. But for what reasons do communities not get to see the tangible results of these so-called ‘win-win’ agreements? Firstly one has to understand that in reality, the extremely unequal power relations between communities and corporations prevent that utopia of “a tide which lifts all boats” from happening. Even during the negotiations of so-called “benefit-sharing agreements”, the community usually finds itself in a tremendously disadvantaged position. Normally, the aim of those agreements is to ensure the community’s equal benefit in extractivist activities, but in fact – and despite the presence of various actors such as governments, NGOs, research institutes and councils –, the negotiations are often transformed into a process used by mining companies to acquire not only relative acceptance by the communities, but also legal protection against eventual latter lawsuits. It is easy to take advantage of the negotiation process because obviously, communities often don’t have the capacities to deal with complex mining projects, contracts and laws, but also because government oversight is extremely weak, both during the negotiations and the follow-up phases. The consequences are usually the same: If finally implemented by mining companies, community projects are often far from really addressing communities’ needs. The second main problem are the negative impacts of extractivist activities itself and their constant underestimation. Mining can threaten the community’s safety, causing severe health damage due to increased air and water pollution from acid mining drainage. 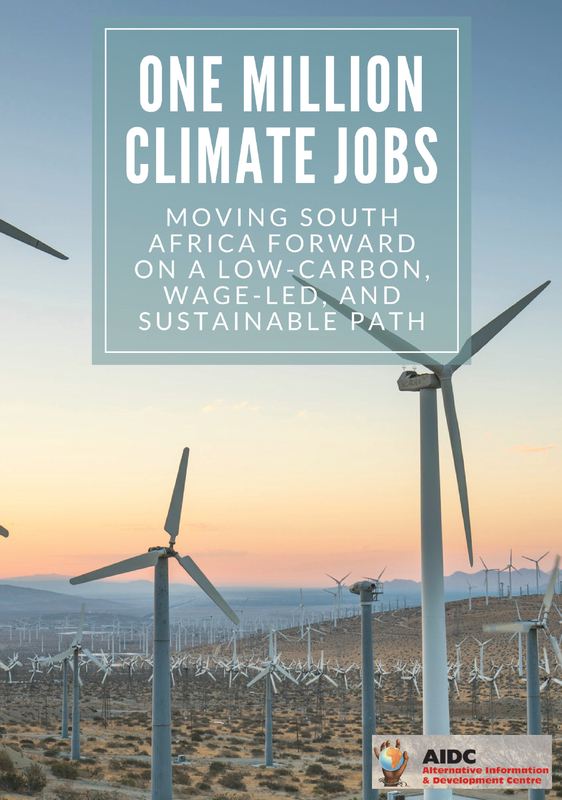 The countless damaging consequences of environmental degradation include decrease of water access and fertile land, often leading to the loss of traditional jobs and livelihoods. Financial insecurity can result in collapsed family structures, precarious work or other risky alternative means of employment. On top of that, since gender-specific socially defined norms and traditions mostly dictate women’s roles in economic and social structures, women bear the brunt of extractivist activities. Most of these negative consequences have differentiated and more extreme effects upon women and therefore lead to an intensification of already existing oppressive structures, affecting the vulnerable ones of society even more. So how can communities, facing such a multitude of different problems, be supported in their struggle against extractivism that denies them their self-determined development? There are already existing instruments, like the principle of Free Prior and Informed Consent (FPIC), which theoretically functions as a protection of communities’ substantive rights. It does not only guarantee the right to be consulted about planned mining activities prior to any realization thereof, but also the right to take a decision, based on provided access to objective information, which is free from any obligation, duty, force or coercion. However, there are a growing number of instances in which local leaders disregard communal interests in alliance with mining corporations. That is why FPIC works in practice often not for, but against communities, as it gives space for co-option of local chiefs and does not stress the need to consult grassroot interests. There have been communities which effectively opposed the mining interests of corporations – for instance the case of the Amadiba Crisis Committee in Pondoland, an area in South Africa’s Eastern Cape, provides a powerful example of how a community did not only reject extractivism and mining, but instead also came up with their own development alternatives like eco-tourism and renewable energy projects. Nevertheless, there are many more communities which lack resources and support to effectively resist the increasing powershift towards companies’ interests. In order to support their struggle, the existing practice of the FPIC is not enough – instead, we need a “Right to say No”. The concept of the “Right to say No”, based on the concept of FPIC, an important step towards the right to self-determined development. It stresses the communities’ fundamental right to not only be involved in- and informed about the plans, but also, in cases of unsatisfying outcomes of negotiating processes, to finally say “No” to the proposals. This essential notion does not only amplify communities’ voices and put them in a more equitable position, but also puts pressure on corporations to respect indigenous knowledge and customary law. The right to say “No” to mining is therefore also the right to say “Yes” to a self-determined living and gives communities a concrete instrument to come up with their own development model through grassroot processes and law from below. 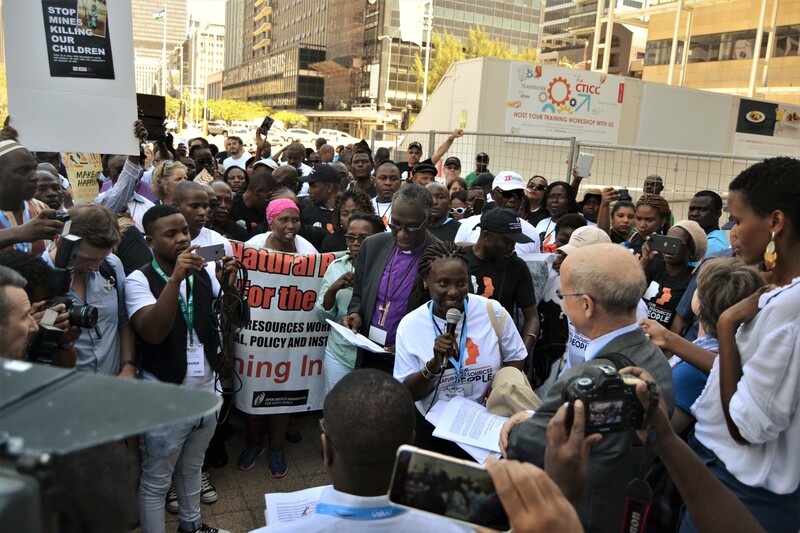 The growing mobilizations around the Right to say “No” and the numerous protests and complaints of communities affected by mining should also encourage us to pose questions at a larger scale. The frequently used argument that “mining creates jobs” and therefore helps our economy to grow fails to consider some key elements. Firstly, the damages to the traditional economy are often underestimated as it is more informal – for instance, the impact of pollution is very hard to assess. In addition, the fact that mining companies are mostly multinational companies leads to massive outflows of money from the vast majority of South Africans to the pockets of international businesses and national elites. One can sometimes wonder if tax evasion and corruption has become the new national sport for the “one percent”. In fact, our collective natural resources do not benefit South African citizens but instead offshore tax havens and a handful of politicians and business people. And last but not least, we cannot forget that extractivism, by its nature, is short-sighted: What happens to an economy which is not diversified enough to be independent from mining – once our mineral resources run out? And the dimension of extractivist devastation becomes even more obvious when looked at it from a global perspective: Throughout entire regions of Africa, South America and Asia, we can identify communities which are struggling with the consequences of extractivism. But equally, movements, organizations and civil society can be found that are opposing these developments. To connect these different struggles, being aware of potential differences in diverse contexts and yet identifying similarities to learn from each other, is the key to forging solidarity and combining the strength of global movements against extractivism. It is the only way to work towards a future where we don’t have to hope for an environmentally and socially devastating lifestyle to “lift our boats”, but where sustainable development models and social justice are achieved – even without any “tide” that is “rising” at all. 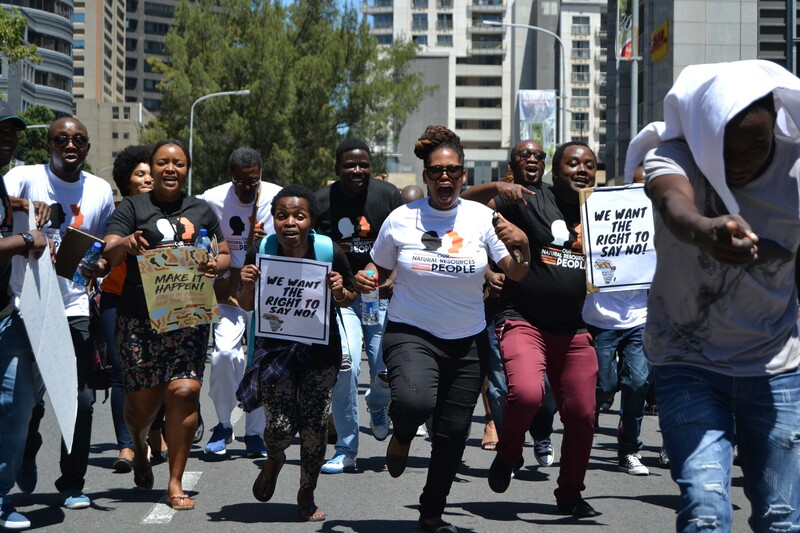 This is what resistance to mining looks like – check out pictures of various events around the Alternative Mining Indaba 2018 here. This destroys THEIR homes, THEIR lives! Under International Law, they DO have the right to say “NO”! I plan on moving down there. The rights of the people should be of paramount importance. Indigenous plant species are found only here on the Wild Coast – are endemic – along this stretch of the WILD COAST. Many families and village communities along the coastline rely on Hiking Tourism along this stretch of coastline. Families grow crops and have for generations farmed here. The red sands of Xolobeni are ancient geological sand dunes where ancient graves lie, and are sacred to local people living there. I have been engaged in supporting eco-tourism here and urge international outcry against mining, and that letters be written to the SA High Commission in your countries and published on Letter’s PAges of your newspapers to garner support. People have been killed, intimidated, manipulated to accept extractive mining as an economic solution? Local communities say no – and have been forced to courts to earn write in constitution to say NO! In South Africa it has been proved that ordinary people do not benefit from mining. 1 Pings/Trackbacks for "We want the Right to say NO!"